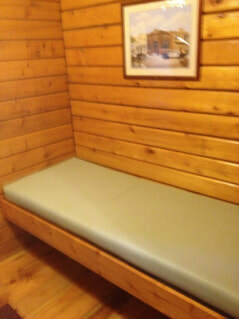 Two Room Deluxe Cabin with 1/2 bath. Our newest rental has a shower in the bathroom. Do you like being in the outdoors but don't want to rough it? Our cabins are just the solution. Our Deluxe Cabins are located in a shady wooded area of the campground. Situated a short walk to our air-conditioned and heated bathhouse with hot showers, private toilet stalls and laundry. Our Deluxe Cabins have two sleeping areas, a full/double bed is located in the main room, and two small single size beds are located in the middle room (sized for children). Along with the full bed the main room has a table and 2 chairs, a dorm size refrigerator/freezer, ceiling fan/light and a 19" flat screen color TV with a DVD player and our New 48 channel cable The Deluxe Cabins are completed with a half bath, toilet and sink. Outside each Deluxe Cabin is a covered porch with seating for three, a fire ring, picnic table, propane grill and water access. All of our cabins/rental units have steps to get inside. Our Jumping Pillow, game room, mini-golf, camp store, pool and fishing pond are all a short walk away. All you need to bring when staying in our Deluxe Cabin are linens, towels, toiletries, food and the desire to have a good fun camping experience making life time memories. Half bath, toilet and sink. Showers are located in the bath house. Dorm fridge/freezer, 19" flat screen tv and dvd player for your enjoyment. Table for two, there is a picnic table located outside that will sit 6.